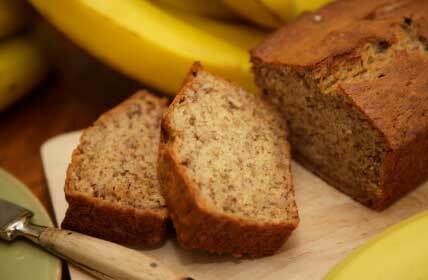 This easy banana bread is a family favourite, and so simple, and can easily be doubled. It just so happens to also be a dairy free banana bread recipe, as we use oil, not butter. Always gets rave reviews. For banana bread with chocolate chips, just add 1/2 cup to the batter after the flour, baking powder & salt combo. For banana bread nut option , add 1/2 cup chopped nuts to the batter after the flour, baking powder & salt combo. Add peeled bananas to mixer, and mix until mashed. Add vanilla, rum and milk, mix well. GREAT in stoneware loaf pan. This can be easily frozen by slicing into serving sizes and placed in either plastic zip bag or good quality plastic container. Then, just pull out the few slices you need at a time – thaws in about 10 min or so. With using light spelt, we haven’t found anyone who’s been able to taste the difference.